The Power Box is a pedal powered generator that generates electricity as you pedal. In addition to the two-bladed socket Americans find in their homes, The Power Box features a universal outlet that adapts to EU, UK, and other world outlet styles. Global citizens and world travelers can leave adapters and converters at home. The Power Box will work with almost any rechargeable device. Just plug your charger in the socket, pedal as if you were on a bicycle, and it will charge your device. The Power Box can power devices up to 20W. Twice as powerful as The Pocket Socket, The Power Box has 20 watts of generation capacity at 120 volts. This is enough to charge low power netbooks, tablets, smartphones, video devices, portable gaming devices, all sorts of stuff! The Power Box can charge multiple devices at one time, for example four smart phones or two tablets. When used with an accessory part, the Power Box can charge a 12 volt battery. A 12 volt battery can be used to store energy and can power certain appliances that the Power Box cannot power directly. 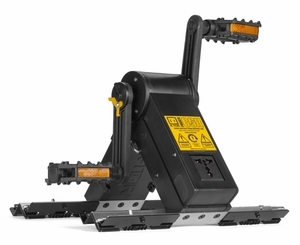 Designed for continuous operation from a seated position, our pedal power generator enables you to generate electricity on a sustained basis. While this generator can be used with either hands or feet, when pedaling with your feet your hands remain free to do other things. The Power Box (folded) is 12 in by 5.5 in by 3.5 in. It weighs 14 lbs, 11 oz. Power output is 120 volts DC, 20 watts.